Our mobile phones have practically become an indispensable appendage, and we spend a considerable part of our lives online, so it makes sense that mobile health and weight-loss apps have become the new fitness trend. From helping count calories, to providing healthy meal plans and tracking weight-loss progress and fitness goals, weight-loss apps offer tools for healthy living; it’s akin to having digital health and fitness coaches, literally, in the palm of your hand. The Noom weight-loss app is fast becoming a favorite, as per Noom reviews, particularly among millennials. Indeed, Noom promotes itself as the “Weight Watchers for Millennials,” partly because it offers personal coaching, and partly because it’s relatively new and designed for the millennial generation. The app-based fitness coaching market is highly competitive, and some names have already distinguished themselves as the “best weight-loss program!” But Noom reviews are also establishing this newcomer as a program to beat, when it comes to success rate and the wide range of tools it offers. A program will be created for you based on your answers to a number of questionnaires. 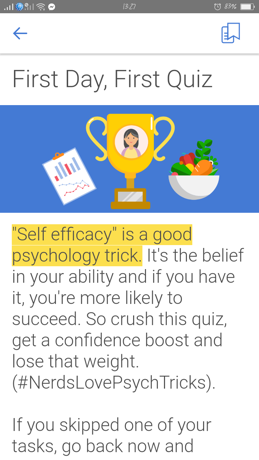 The first set of questions will show you a graph of how your weight-loss progress will look over the next two months, based on your height, current weight, level of activity, type of diet, and weight goals, if you’ll choose to use the app for this recommended minimum period. Whether or not you start with a free trial or jump right in and pay for a subscription, and after another set of questions to get more specific information about your lifestyle, preferences, and goals, a customized 16-week weight-loss course/nutrition plan will be made available to you. 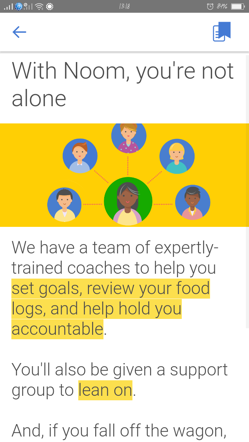 You will also have access to a personal “Goal Specialist” and a “Group Coach,” whom you can easily consult through the app’s handy chat feature. Over your 14-day trial or 16-week course, you will log your daily fitness activities and food intake and keep track of your progress using a customized checklist. The customized program also includes an educational element – with health tidbits and blogs, witty motivational prompts, and even quizzes. 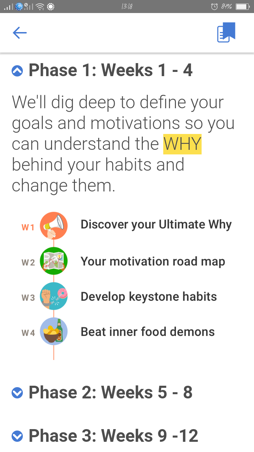 This particular feature – which is unique to Noom – aims to also affect lifestyle changes when it comes to nutrition and fitness, by helping you better understand the steps you’re taking towards your goals and getting you in the right frame of mind to keep you going. 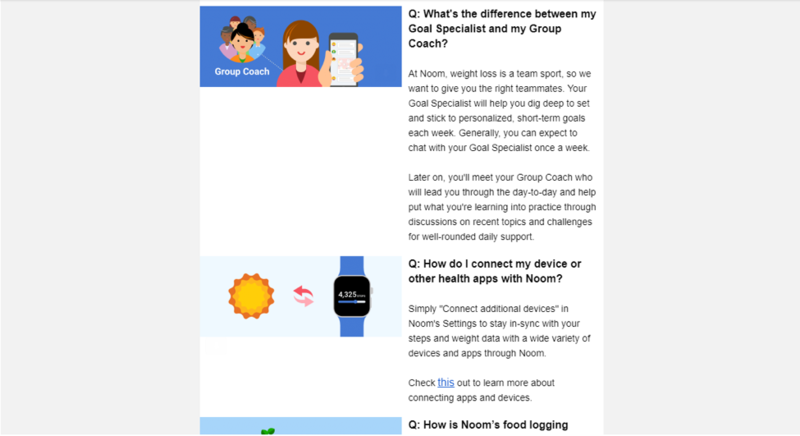 And in addition to the “hand-picked support group” made up of your Goal Specialist and Group Coach who will help you “set goals, review your food logs, and help hold you accountable,” Noom also connects you with other subscribers, who are 45-million strong and with whom you can talk to through the app’s chat feature – adding another layer of support to your system. Noom is designed not to make you independent on it or to follow a strict eating plan to stay on track with your health goals. The app also educates you about how to live more healthfully, wherever you are and whatever the occasion, so you can make confident and informed choices. The app has the unique feature of giving you access to health coaches and nutritionists, and a huge online community to give you the support you need when you need it. You’re also given a personal coach and a group coach with whom you can communicate through the app’s chat feature. Other Noom users are also reachable through chat. Your personal coach actively checks in on you on a regular basis to remind you about setting Specific, Measurable, Attainable, Realistic, and Time-oriented (SMART) goals. Your coach will also help you understand the causes of your weight problems and frustrations and your motivations for wanting to improve your health. If you’re already using any of the following health apps, Noom can sync with it so you can have more tools at your fingertips: Fitbit, Fitbug, Runkeeper, YOO, Bewell Connect, Biomedtrics, Misfit Wearables, Movable, Moves App, Garmin Connect, Polar, Qardio, Jawbone UP, iHealth, Lifelog, Lumo, Life Trak, Striiv, and Withings. Noom does not promote a certain diet; it does not impose any food restrictions. It promotes making healthy food choices and educates you on how to achieve nutritional balance, even while you give in to some of your guilty cravings now and then. Noom promotes a healthy way of life. 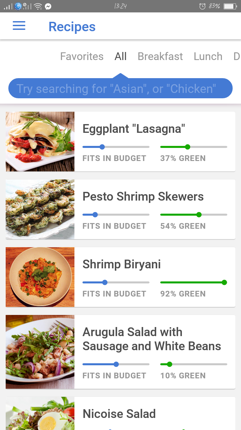 Noom’s color coded food categories will help you easily determine the “good” from the “bad,” so you can maximize consumption of the former and minimize the latter. Noom also address the underlying causes of your unhealthy relationship with food, such as stress, boredom, and other emotional issues that affect your eating habits. The app’s eating plans are created by registered dietitian nutritionists (RDNs), so you can be sure that your personalized meal recommendations will help you get closer to your health goals. The support you get from real people – your coaches and Noom’s online community – can help keep you motivated, especially when you’re struggling with your food issues. The daily consultations with your personal coach also provides the benefit of receiving quick resolutions to food and fitness challenges that you may face throughout the day. Noom’s subscription cost is on the pricier side – almost $50 per month, and the customized plan created for you is good for four months. The monthly payments are automatically deducted from your credit card or PayPal account, but you can cancel your subscription at any time. Customized meal and workout plans also cost extra. Some people might find it too tedious to log in every ingredient of every meal they eat. But it’s the only way to effectively track progress and receive the appropriate recommendations from your personal coaches. Noom is designed to help you make real lifestyle changes for lifelong health, and this means you will have to commit to being proactive and to putting in the daily work needed to affect the change you need and reach your goals. For people who are only after an easy solution to their weight-loss problems, Noom’s overarching strategy could prove overwhelming. Noom’s color-coded food categories which divides foods into either “good” or “bad” may not be the most effective way to promote a nutritionally-balanced diet, and may still feel restrictive, according to some experts. Except for Noom’s RDNs who design the meal plans, not all of the app’s health coaches/specialists are registered dietitians; they’re not certified by the Commission on Accreditation for Dietetics Education (CADE). But they are certified by the International Consortium for Credentialing Health and Wellness Coaches (ICHWC), which requires passing one of its approved university programs and the ICHWC exam. Noom’s health coaches are only available for consultation during business hours. Aside from Noom’s diabetes management program, the app is not designed to help with other conditions and special dietary needs which could be associated with weight problems. Why should you choose Noom? You’re a newbie in the health and fitness world and need help organizing and setting your goals and keeping track of your progress, and you want to learn along the way. You’re genuinely interested in learning how to be healthy and fit for life, and you’re serious about making the necessary lifestyle changes not only to lose weight, but to improve your quality of life. You’re not looking for a quick fix to your weight-loss problems, and you realize that you need help making behavioral changes for your health. You have real initiative and can commit to following the recommendations and overall program designed for you. You’re not averse to spending a big chunk of your time on your phone. Working with an actual coach/trainer and going to the gym are not an option. For any diet and fitness program to be successful, you need to enjoy it to some degree and/or be motivated enough to commit to it. The reality is, if you’re looking for a program to help you with your weight-loss goals, chances are you struggle with food issues and engaging in regular physical activities. It’s more than likely that your overall lifestyle is an unhealthy one and you need the guidance of a carefully constructed diet and workout plan. The Noom weight-loss app may not be for everybody, but it offers a wide range of features that can be customized for anyone. At the end of the day, whether or not you’ll reach your weight-loss goals is still up to you – how badly you want them and how hard you’re willing to work for them. The Noom app will definitely provide tons of help, but you will still decide how you’ll use the tools made available to you.